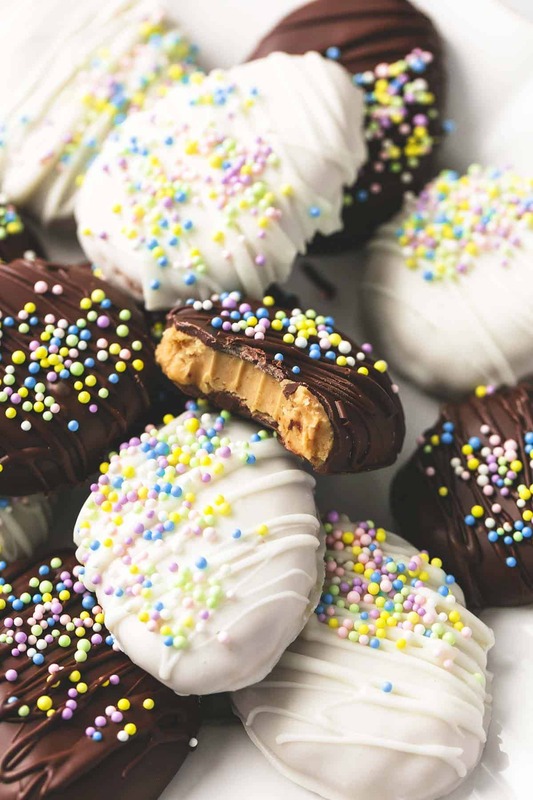 Copycat Reese’s creamy peanut butter eggs are SO easy to make no-bake treats and positively addictive with that rich chocolate and peanut butter combo! If you’re loving this Easter dessert, you’ll want to try World’s Best Carrot Cake with Cream Cheese Frosting and Spring Confetti Crockpot Candy. O B S E S S E D with these creamy peanut butter eggs. I mean, Reese’s really knows what they’re doing with the whole chocolate and peanut butter thing. I love chocolate, and I love peanut butter, but together it’s trouble. I can’t stop myself. And now I’m making that magic happen at home in my bunny slippers and top knot, indulging in front of Netflix Gray’s Anatomy marathons. All it takes is five ingredients. Well six, if you wanna be all festive and use sprinkles – which you do! You do want to be festive and use sprinkles. 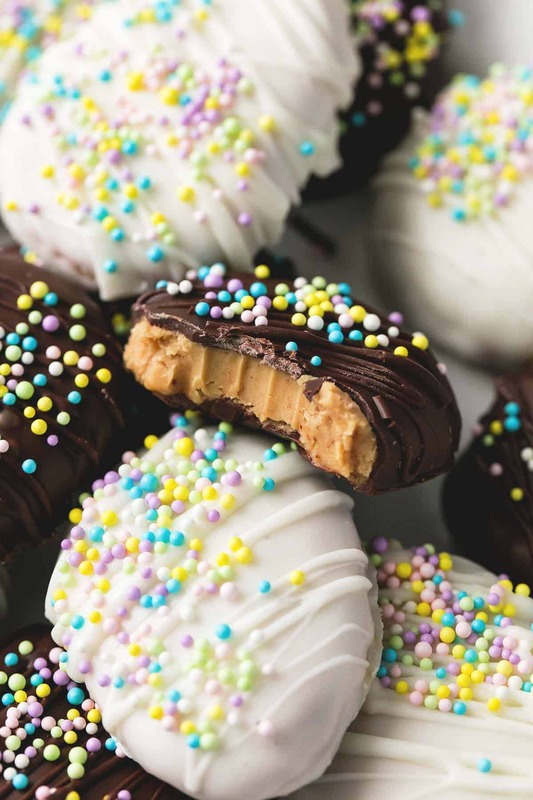 If you can convince yourself to have some self control and part with a few of these copycat Reese’s peanut butter egg beauties, they make a fantastic neighbor gift. Or Easter basket stuffer. In case you know the big bunny and he needs an idea. 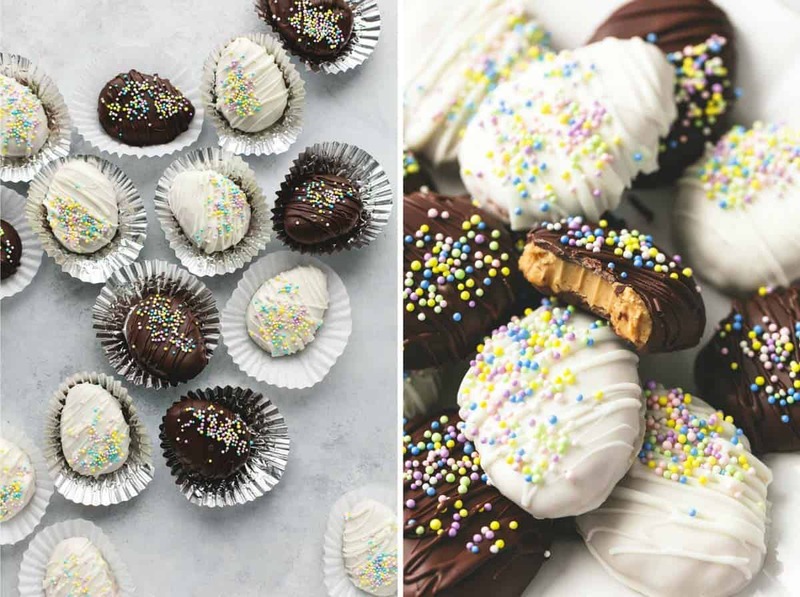 These are even more dangerous because they are NO BAKE, made with basic pantry staples, and ready in less than a half hour. That means within 30 minutes of right now you could be sinking your teeth into Reese’s peanut butter egg deliciousness without even leaving your home. They may be diet wreckers but I am telling you…. these creamy PB eggs are WORTH IT. Your swimsuit will understand. Besides, it’s February. You can indulge a little with time to spare to get ready for bikini season. That’s the real magic of being able to make these before (or after!) they’re available in stores for Easter. Plus these ones are prettier. just sayin’. Copycat Reese's creamy peanut butter eggs are SO easy to make and positively addictive with that rich chocolate and peanut butter combo! They're no bake and ready to eat in 20 minutes! Combine peanut butter and butter in a medium-large microwave safe bowl. Microwave for 1 minute. Stir until smooth. Add vanilla and powdered sugar and mix until sugar is completely incorporated and there are no streaks of white. Mixture should be very thick. Use a spoon or spatula to spread mixture out to an even layer (doesn't have to be perfectly smooth, you just want the mixture to be spread out so that it chills faster and evenly). Transfer bowl to the fridge or freezer (faster!) and chill for 10-15 minutes. Meanwhile, line a small baking sheet (if you don't have a pan small enough to fit in your fridge or freezer, you can use plate) with wax or parchment paper. When peanut butter mixture is chilled (just needs to be cooled and fairly firm, not totally cold), remove from fridge or freezer. Scoop out about 3 tablespoons of the mixture, roll into a ball, then place on baking sheet. Use the palm of your hand to flatten the ball to less than 1/2 inch thickness, then shape with your fingers to make it egg-shaped. Repeat with remaining mixture. Transfer to fridge or freezer for 3-5 minutes. 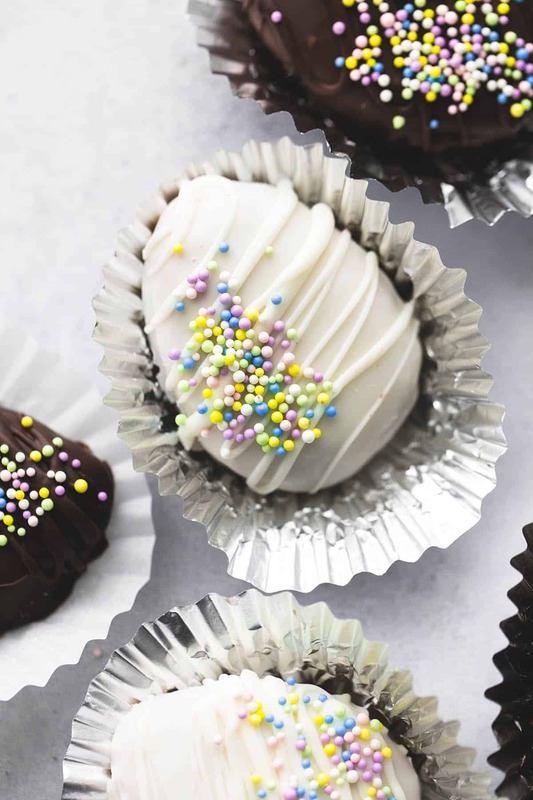 While eggs are chilling, place chocolate in a microwave safe bowl (if using both white and dark chocolate, place them each in a separate bowl and melt separately) and microwave on half power for 1 1/2 minutes. Stir until smooth (return to microwave on half power for 20 seconds if not completely melted yet). 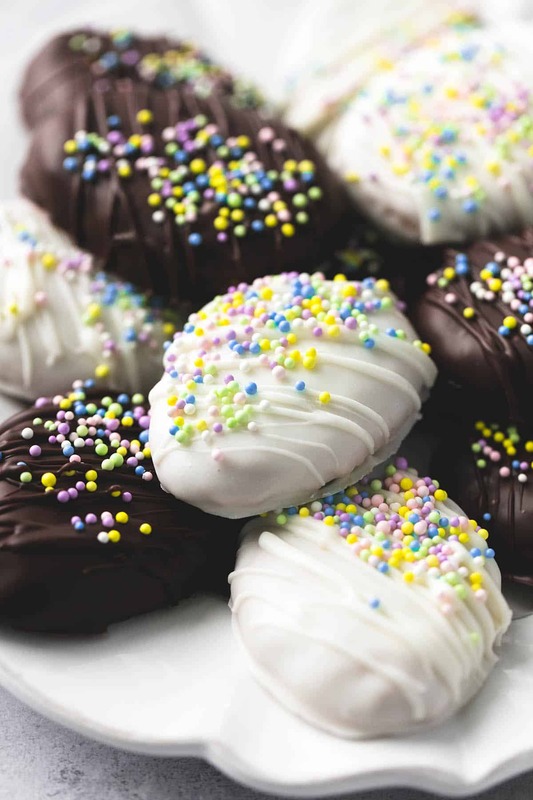 Remove peanut butter eggs from fridge or freezer and use a fork to dip them one at a time into the melted chocolate - tap the fork on the side of the bowl after each dip to drain excess chocolate - then transfer back to baking sheet. Drizzle with a bit of extra chocolate and top with sprinkles if desired. Repeat with remaining peanut butter eggs. Allow to cool for a few minutes (you can transfer back to fridge or freezer for a minute or so and they will harden very quickly) and serve or store at room temperature. 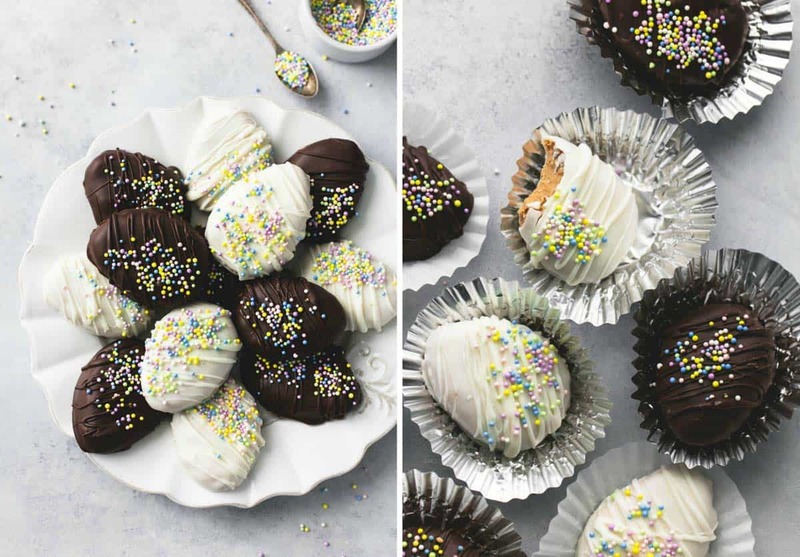 Try these other Easter Desserts you'll love! hey girl these look amazing! have a great weekend! Thinking of trying these for work. Would use some dark chocolate but more white w small batches w a drop or two of food coloring to make pastel eggs. Just like you would hunt for outside on Easter. anyone know how these will be if shipped?